The nationally designated Northwest Passage Scenic Byway follows U.S Highway 12 from Lewiston to Lolo Pass, including a spur from Kooskia to Grangeville on Highway 13. The Byway is not only one of the nation’s most scenic byways but also one of its wildest and most historic. It commemorates the Lewis & Clark Expedition’s 1804 – 06 successful effort to carry out President Thomas Jefferson’s commission to find the “northwest passage” to the Pacific Ocean. The byway crosses a portion of the Nez Perce Indian’s ancestral homeland and parallels the expeditionists’ west – east routes, which roughly followed the Nez Perces’ ancient trail to the buffalo plains. As travelers drive the byway, they have opportunities to visit Nez Perce cultural sites, such as the Nez Perce National Historical Park Visitor Center at Spalding and the legendary Heart of the Monster site in East Kamiah, and to stand in the footsteps of Lewis & Clark at expedition sites. 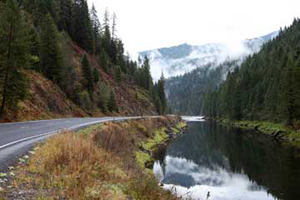 The byway owes its scenic beauty to the pristine mountainous watersheds of three nationally designated Wild & Scenic Rivers – the Lochsa, Selway and Middle Fork Clearwater. At Kooskia, the Middle Fork joins the South Fork to create the Main Clearwater, which meets the Snake River at Lewiston. The byway runs through the Nez Perce-Clearwater National Forests, fringes the Selway – Bitterroot Wilderness and runs through the rugged Clearwater and Bitterroot mountains, which range in elevation from 1,800 – 10,000 feet. The 1.3 million acre roadless Selway – Bitterroot Wilderness, along with the 4 national forests within which it lies and the adjacent Frank Church – River of No Return Wilderness to the south comprise what many people rightly call “The Big Wild.” It is home to cougar, black bears, wolves, moose, elk, deer, wolverine, salmon, steelhead, trout, osprey, heron, eagle, and many more creatures of the wild. The Selway River – with 100 of its 121 miles flowing through designated Wilderness, is the longest stretch of virgin river in the United States. The Selway and Lochsa are revered nationwide as world-class whitewater rafting and kayaking rivers. The Big Wild also lures hikers, hunters, horseback riders, birders, picnickers, campers, fishers, skiers and others who value the region as an outdoor-recreation paradise. As suggested above, the byway additionally offers an exceptionally rich treasure trove for professional and casual historians fascinated with the full panoply of Old West characters — Indians, explorers, mountain men, missionaries, gold miners, outlaws, settlers, hustlers, cowboys/cowgirls, and more. For all of the above reasons, the Northwest Passage Scenic Byway – Highway 12 draws thousands of people every year from all parts of the country and world.